Another weekend, another baby shower! I feel like everyone I know is pregnant or just had a baby. Today I went to a baby shower for a friend expecting a little boy after two sweet girls. 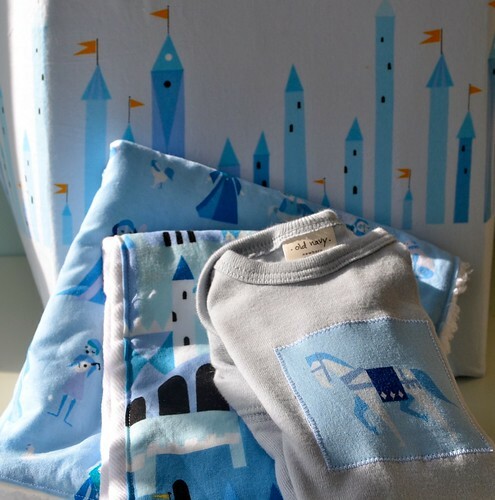 Lizzy House's Castle Peeps line in the blue colorway seemed just perfect for this eagerly awaited addition to their family. I made this bin pretty much the same way as my tutorial for the Fussy Foldover Basket, but with larger pieces (22" wide x 17" tall with 5.5" squares cut out the bottom corners) and the addition of pellon craft fuse for serious stiffness. Also, obviously, no pocket or folding over. Happy to make up a tutorial if anyone is interested, as I could use one of these for myself! Inside I stuffed some diapers along with a onesies, burp cloth and blankee with more fabric from the Castle Peeps line. Not the best picture, but the sunshine was just streaming in this morning (not complaining at all!) and now the goods are gone! I love your creations, so a tute is always welcome! I truly love your gifts - Castle Peeps is perfect for the new baby prince! such a great use of that fabric! You are the best!!! Thank you for your encouragement:) Of course I would love a tute...not that I can do as well as this stunner! But, I could try. I'd love a tutorial. 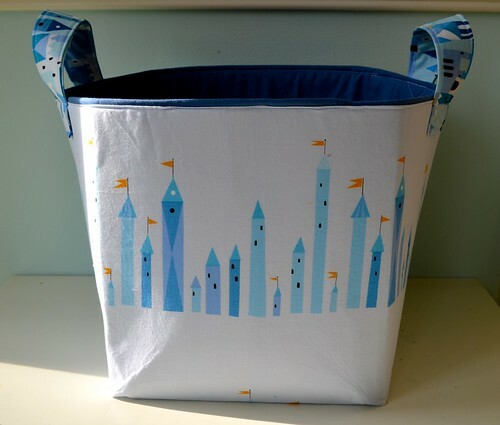 I want to make some of these bins for me and some for my daughter to use in her nursery. I'd be very interested! It looks like the perfect shape and height. You make the cutest things!! I know your friends are happy to get your creations!! Keep inspiring us!! You have a very lovely Blog. Those are adorable! Such a sweet gift. Can't wait to see you this weekend!